We are about to embark upon a very important process that could define the parameters for nigh-on complete integration between Latin America and the Caribbean and the European Union. And this, strange as it might seem, might well create the conditions for a very wide-ranging agreement over the integration of Latin America, using the agreement with Europe as its basis. What are the conditions required for such optimism? Firstly, progress, serious progress this time, in negotiations between Mercosur and the European Union. Secondly – depending on the group of countries in our region that would be linked to that market – finding a way to apply the concessions and agreements with Europe to genuine Latin American integration. In recent weeks, I have had the privilege of exchanging ideas with officials from the new Argentine government and the President of Uruguay, Tabaré Vázquez, who now, soon to complete a year of his mandate, is also to assume the presidency of Mercosur. I also talked to important advisers and analysts in the region at the recent meeting of the Council of International Relations of Latin America (RIAL) in Buenos Aires. All these different points of view coalesce into a promising perspective. There is every reason to believe that the change in Argentina will make it possible to return to a path that has been somewhat neglected of late in conversations between Mercosur and the European Union. It dates back quite a while: to 1996 when the Europeans agreed in Florence, Italy to begin discussions over an agreement with Mercosur and Chile. It was indicated that the European Union would advance pari passu (step for step) with both simultaneously. Until 2002 it was necessary to take separate paths because, of course, negotiating with a country is easier: Chile had made a lot of progress in establishing the conditions for this agreement and Mercosur was left until later. 13 years have passed since then. In the meantime, however, the range of commitments with the European Union, as well as Central American countries and the Dominican Republic, has expanded to a promising extent. In the south, treaties signed by Colombia, Peru and Chile were joined by Ecuador in 2014. 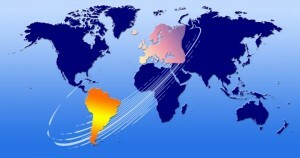 If Mercosur, or at least its four founding partners (Argentina, Brazil, Paraguay and Uruguay) decide to restart negotiations and they are completed successfully, it can be said that almost all of Latin America, with the exception of Venezuela and Bolivia, will have a similar set of commitments with the continent. Since 2008, the CARICOM countries have been part of an economic partnership agreement with Europe. Cuba is another question entirely, but after renewing relations with the United States, it is talking to the European Union which would be more than willing to include a commercial understanding in its negotiations. This would help Venezuela and Bolivia join the initiative. If everything unfolds as suggested, Europe will be able to say that it has reached an agreement with a significant group of countries in one continent: we would be at the vanguard. We know that in these negotiations with Mercosur there is a complex and difficult issue to be overcome: that is agricultural exports to Europe and the implicit barrier of the agricultural subsidies currently in force there. Not long ago it was estimated that up to 700 euros is being paid to anyone who has a cow and meets the requirements to receive it. Negotiations aren’t easy when such a huge quantity of resources are in play. But times are changing. After the trade agreements at the 10th Ministerial Conference of the WTO held in December in Nairobi, subsidies for the exportation of agricultural products were eliminated, which will go a very long way towards resolving this difficult issue in any negotiation between the European Union and Mercosur. In addition, Germany could be a good mediator for Latin American and Mercosur demands for the elimination of export subsidies. But now we move on to the second part of the strategy. If Latin American countries manage to sign this set of agreements with Europe, will it be possible for us to sit down and assess whether we are in a position to provide these benefits to each other? In other words, if we put all the agreements with Europe on a table, will we be able to say that each of us will provide these same advantages to the other countries in Latin America? Undoubtedly some exceptions will need to be established. However, the essential point is to understand that we could be at the threshold of an enormous leap towards integration and the agreement with Europe would be a good basis for that integration. In fact, in several cases, our own intra-regional agreements, such as those signed between Chile and Mexico, have made a lot of progress in establishing an extensive platform of commercial and cooperative agreements. It would be important during negotiations with the European Union to establish whether we would be allowed to pool the origin of products in our region with those from Europe to thus expand the opportunities for our exporters to join the global value chain of international commerce. As a region, the European Union has opened negotiations over free trade with the United States and has also expressed a willingness to do so with China. If Mercosur’s understanding with the Europeans is consolidated we will be sealing an important process for the region and, in addition, with the European Union-Latin America dialogue as a blueprint, we may be paving the way towards rethinking regional integration. In this context, an opportunity emerges for President Tabaré Vázquez to take the reins of Mercosur with a view to a long term strategy. It seems that he is willing to do so. If we do this, we will be in tune with the times because governance in the future will be much more about understandings between regions and continents than individual countries.